Angora goats are the highest fleece-producing ruminant on a body weight basis. As with wool-producing sheep, poor nutrition affects mohair production by Angora goats, as well as affecting gain or maintenance of body weight. 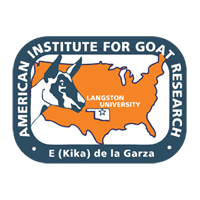 Pastures for Angora goats vary widely with season and rainfall in quality and available forage mass, often resulting in seasonal reductions in mohair growth, body weight, and body condition. Mohair production and body weight can be increased during periods of poor grazing conditions by supplementation, though with associated monetary and labor inputs. Hence, a better understanding of effects of nutrition on mohair production could lessen production costs or increase productivity of Angora goats. On a long-term basis, changes in mohair production and body weight elicited by nutritional plane and supplementation are positively related. However, physiological processes controlling body weight gain and mohair growth differ. Thus, short-term periods of nutrient restriction may have dissimilar magnitudes and durations of effects on body weight and mohair growth. Hence, objectives of this experiment were to evaluate mohair growth and BW change during and after different levels of feed intake restriction. Based on results of this experiment, different levels of restricted feeding of a 14.7% crude protein, 70% concentrate diet for 40 days decreased mohair growth in the last 20 days of the restriction phase and also in the last 21 days of the subsequent 41-day realimentation phase, even though body weight change in the latter part of realimentation increased with increasing severity of previous feed intake restriction. In conclusion, feed intake restriction can have longer term effects on fiber growth than body weight change, suggesting that special attention being given to avoiding even short-term periods of low feed intake if maximal fiber production is to be achieved.